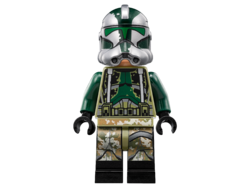 Commander Gree is a Star Wars-themed minifigure first released in 2012. This minifigure has white legs with a black hip joint. The upper part of the front of the legs are printed dark green, with black printing used for detailing and for representing the knee armour plates. The torso piece is white, with black hands and features the standard The Clone Wars Clone Trooper black and dark grey printing pattern, but with some extra details. On the front, a strip of dark green printing is present from the top of the chest plates in the center, which widens and covers nearly the whole width of the torso just above the belt. A black bandolier with dark grey outlining is also printed on the torso, running from the right shoulder down to just above the belt on the left. Additional printing is also found on the back, with the bandolier continued, a small horizontal strip of green above the backplate, and a more significant dark green design between the backplate and thermal detonator. Gree's head is flesh-coloured, and features the standard The Clone Wars Clone Trooper face- black eyebrows, a black mouth with a serious expression, and white, black and brown eyes. Gree's white helmet features the standard black visor print, with additional dark green down the centre of the helmet and narrowing at the bottom, but leaving the helmet's crest white. One area to each side on the front of the helmet is also coloured in green. The minifigure comes with one other accessory- a black blaster. Senior Clone Commander CC-1004, nicknamed Gree, was a Clone Trooper during The Clone Wars. Gree commanded the 41st Elite Corps, and served under Jedi General Luminara Unduli. Gree and Luminara, along with several other clones and Jedi including Luminara's Apprentice Barriss Offee, participated in the Second Battle of Geonosis. With General Skywalker's assigned officer, Captain Rex, Gree led the clone army into battle with the Jedi. Two years later, Order 66 was put into effect and Gree alongside a Clone Scout Trooper attempted to assassinate Jedi Master Yoda (whom the 41st Elite Corps were temporarily assigned to), but the Jedi sensed what was about to happen and decapitated both troopers. This page was last edited on 13 February 2016, at 23:20.